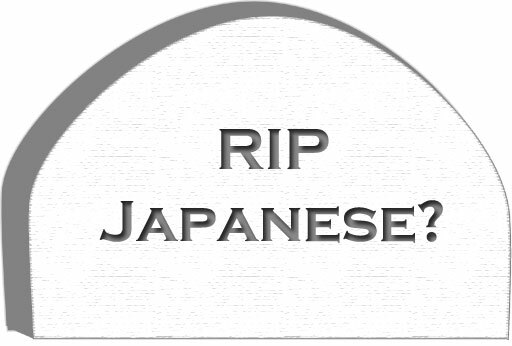 iKjeld.com » News » Society » Rest in Peace Japanese? The AFP reports that Japanese students “rush for English-language education,” which would be a dramatic reversal of the trend of the past few years among young people to show less interest in foreign countries and cultures. The article features ridiculous quotes by novelist Minae Mizumura. “Cultural purists worry about the rush for English and a Western education,” writes AFP reporter Kyoko Hasegawa in her article Japan students rush for English-language education. A “fervor for education in English without a national strategy is a recipe for the decline of Japanese,” wrote novelist Minae Mizumura, who recently caused a stir with her essay “When the Japanese language goes extinct”. “We already have a solid translation culture in which almost any kind of intellectual dialogue can be read and spoken in Japanese,” she said. This is a very stupid statement displaying a great disregard of the reality of being multi-lingual. It is one of the oldest fears around the world and has yet to be proven correct. In their time, Greek, Latin and French were lingua franca, but they didn’t kill off other widely spoken languages. Japanese author, writer, teacher, translator and political theorist Yukichi Fukuzawa was fluent in Dutch and English. His knowledge of other languages clearly did not impede his Japanese. It didn’t make him any less involved in Japan either. He introduced a large number of new Japanese words, founded Keio University and contributed enormously to the development of constitutional government and social institutions in Japan. He is actually regarded as one of the founders of modern Japan. His ability to speak foreign languages greatly enriched Japan as well as the Japanese language. Although Fukuzawa’s influence was extra-ordinary, he is no exception. Exposure to different cultures and ideas of thinking makes you more aware and appreciative of your own and gives you the ability to look beyond the constraints that habit and tradition force upon people. No translation can offer that. You need direct exposure for any influence to take effect. Each nation needs as many people as possible who have this ability in order to adjust itself to new demands and new realities. History has taught us again and again that if a nation or culture can’t transform itself, it is doomed to fail. Even more important, deliberately attempting or encouraging to limit someone’s personal growth is a gross violation of that person’s rights as an individual human being. Each person should be given every opportunity to enhance and improve him or herself. It is ironic that Mizumura would make this statement. She was educated in the US and she wrote her first published work in English. She is well-known for her strong commitment to Japanese literature and the Japanese language. And although she grew up in the US, she choose to return to Japan as an adult. Isn’t she herself a perfect example of someone becoming more aware of her own culture and language through the medium of another? Intellectual conversations in Japanese will not vanish when a large number of Japanese become multi-lingual. On the contrary, they will be enhanced. When people struggle to integrate their new insights and ideas into their own cultural identity they generally use their own language as their medium to do so. Mizumura herself is an excellent example of that. I wonder if some critics of the study of foreign languages perhaps worry—maybe even at an unconscious level—that Japanese may become too self-aware in their quest to enrich their thoughts and experiences. This is absurd! How could people still think like that?